Thursday is CSA pick-up day and we finally had proof of the existence of summer: a surprisingly heavy bag out of the cooler at Annye’s. So heavy I was impatient to look inside; I couldn’t even wait to get home before untying the knot and rooting through our treasures. In addition to the standard fare of beets, kohlrabi, carrots, lettuce, greens, and herbs, there was squash! Tomatoes! Cucumber! Eggplant! Garlic! Onions! This is my favorite part of summer – garden fresh veggies – and I’m so excited to get to cook them all up for Nora, who will eat just about everything we give her. Including almost a whole peach – she would have tried to eat the pit if I’d let her. Since we’re an adventurous, veggie loving family, we’re really hoping she will be too. And so far, there isn’t much she doesn’t like. Avocado isn’t her favorite (something’s wrong with that), but she’ll eat it. I’ve mentioned before her dislike of blueberries (what a weirdo). We’ve discovered that plums might be too tart on their own, and she’s pretty much decided that she’s not into beans unless they’re mixed with other things. Other than that she is a fabulous eater. Especially if she can feed it to herself. 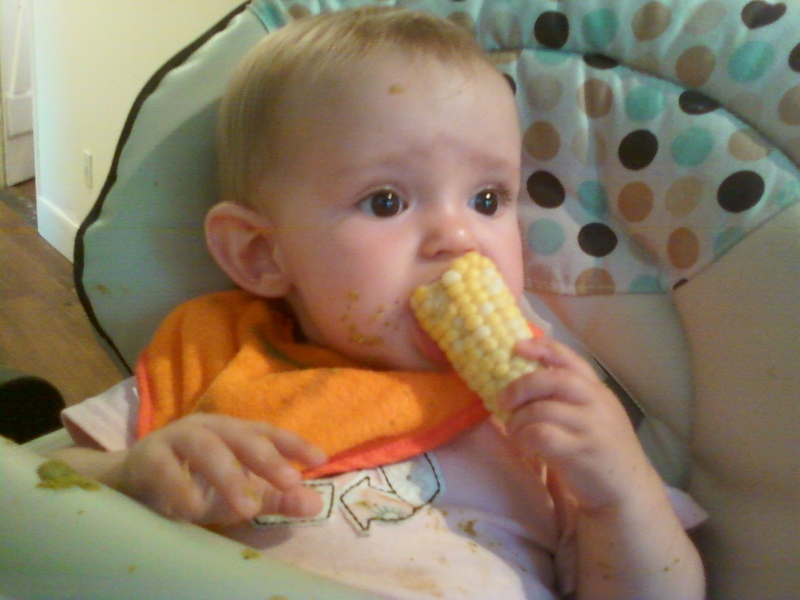 First ever corn-on-the-cob, sans butter, of course (and that’s basil-zucchini puree she’s covered in). So we don’t have to worry about pickyness now, but I’m nervous about the years ahead. Because Mr. V, the three-year-old I watch, eats pizza and chicken fingers and french fries. And I have vivid memories of my younger cousins eating day-glow orange mac’n’cheese for Thanksgiving dinner. I shudder, just to think that might be our future. But, then I think about my little brothers, Andrei and Nathan, who used to love cabbage and salad when they were adopted at the age of six. They loved it, because that’s what they had to eat in Russia. Or, I think about the post I saw recently on Origami Mommy about Japanese school food. The menu from her children’s school includes tofu and kinoko mushroom soup, edamame, mackerel croquettes with grated daikon, and cabbage and corn salad – all fresh and from scratch. So how is it that Japanese and Russian kids eat healthy, balanced, and colorful meals, while American kids are doomed to years of golden, fried and processed, carb heavy crap? Don’t get me wrong, I eat my fair share of slop, too, but that’s not all I eat – unlike kids who have the same menu winter, fall, and spring, whether Italian, Chinese, or Indian. So, as Nora ventures further and further into the land of food, we have to figure out how to encourage her adventurous side and discourage the picky-eating American kid that’s sulking just under the surface. Chris thinks it’s an easy solution of only cooking good meals, then letting her eat it or go hungry (her choice), and not indulging her with safe foods. But is it that easy? Not only am I worried about her taste buds, I also want to raise a child who is aware of food choices, who is aware of the work that goes into food before it arrives in our kitchen, and who is aware of the environmental and ethical implications of certain foods. I started reading Spoonfed, a blog about raising kids to think about food, and I know we won’t have any problem modeling good food choices in our home, but I’m still worried about the toddler-tongue and it’s hatred of everything not fried, cheese-smothered, or ketchup. Do you have any suggestions for us? Is there anything we can start doing now to insure she doesn’t suddenly change her mind about trying new foods? What you are doing for Nora is wonderful. I have three sons 14, 11, 8. Two of them will eat anything that I feed them. The other understands what is good for him and what food choices he should make but alas, he loves the bad stuff. He knows what he should eat and in time, I’m convinced he’ll come around. Don’t be a short order cook. Make a meal and let everyone know that is what you’re eating. You’ll get there and you’ll be happy you did. if it’s not int he house, she can’t eat it. I was raised almost entirely on tv dinners. now, I feed my self with fresh foods that I cook. tv dinners are easier, but I don’t buy them, so i can’t eat them. Nora will be fine. there will be things she doesn’t eat and times she misses a meal out of stuborness. but she’ll grow up knowing what is good for her if you make it part of the meal to talk about where things come from and why she should eat them. no worries, I think with her daddy the chef, she’ll be fine with foods at your house!